to authoring new posts in Sandburg's Hometown! This should be #272! A snow blockade in southern Minnesota (March 29, 1881). 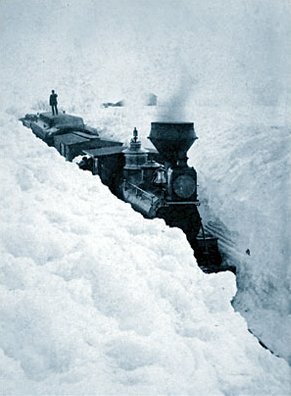 Snowdrifts in Minnesota were higher than locomotives. The Galesburg Republican-Register wasn’t published on Sunday, March 25, 1881. Sunday was meant to be a day of church attendance, the eating of a large dinner and quiet contemplation. The Monday edition was full of news about the weather and the railroad. The snow storm had come in on Saturday and was the worst of the season. There was no mention of the number of inches of snow that had fallen. The passenger train which left Galesburg for Chicago on Saturday morning was stuck in a snowbank west of Altona. A deep cut near the town had drifted full of snow. The morning train from Chicago met a similar problem near Kewanee. A freight train was completely covered with snow in a deep cut east of Neponset. The snow was heavy so it packed solidly. The railroad snow plow which started from Galesburg traveling east jumped the tracks near Galva. It wasn’t until Monday afternoon that the men and equipment sent from Aurora were able to meet the Galesburg crew and fully open the tracks. The snowplows from Quincy and Galesburg were able to open the road by Sunday afternoon meeting at Colchester. The Peoria and Burlington branches had been cleared of snow and were running by Monday morning. The editor also mentioned that the bluebirds and robins sat among the trees as if they never saw a snowflake. They had been a sign of spring in the minds of many citizens before the storm struck. The Chicago, Burlington and Quincy Railroad Company issued its annual statement of statistics and the newspaper reprinted a good many of them. The company owned 384 engines. The miles covered by passenger trains amounted to more than 2.5 million. Freight miles were more than 7.3 million. Mileage for repairs, construction and switching added up to 2.1 million. Fuel used consisted of 487,918 tons of coal and 13,060.50 cords of wood and 817,574 pints of oil. The locomotives averaged 26.47 miles per ton of coal and 10.58 miles per pint of oil. The combined wages of the engineers, firemen and round house men amounted to $952,580.14. There was no mention of wages paid to track workers, office clerks and others, such as August Sandburg. The company also reported on the number of animals struck by the engines: 13 horses, 36 cows, 45 hogs and 3 sheep. In those days animals were allowed to graze and wander at will. There was no mention of compensation to the owners. Complaints about the winter we have just experienced with so many days of sub-zero temperatures, snow and ice have been frequent. Let’s hope there won’t be a blizzard on March 26, 2019.